If you own a boat, you probably enjoy taking it for an adventure out in the water. You want to feel the wind in your hair, the water splashing on your face, and the waves of the ocean beneath your vessel as you travel away from land. Unfortunately, the further you travel from land, the more dangerous it becomes for your health and the health of any passengers you might have aboard with you. Because if you or someone on your boat suffer from cardiac arrest even while you’re still at the dock, it could take a significant amount of time to get the help you need. If you’re already out on the water and you or one of your passengers suffer from a cardiac arrest, it will take even longer for medical assistance to arrive. That’s why it is so important to install an automatic external defibrillator (AED) on your boat. With that in mind, let’s discuss what an AED is and why they are truly the ultimate life preservers. An AED is a device that can send an electric shock to the heart in the event that someone is experiencing sudden cardiac arrest, a.k.a. SCA. SCA occurs when the heart suddenly stops beating, preventing blood from flowing to the brain and other organs. One reason this happens is because abnormal heart rhythms (or arrhythmias) can cause the heart to beat irregularly, causing the heart to stop pumping blood to the rest of the body. These arrhythmias often occur without warning and can result in sudden cardiac arrest for unsuspecting victims. How do you know if someone is experiencing SCA? SCA can occur at a moment’s notice, and that is why having an AED on your boat is so critical. With an AED, you can save your life or the life of a loved one in the event of a life-threatening emergency. 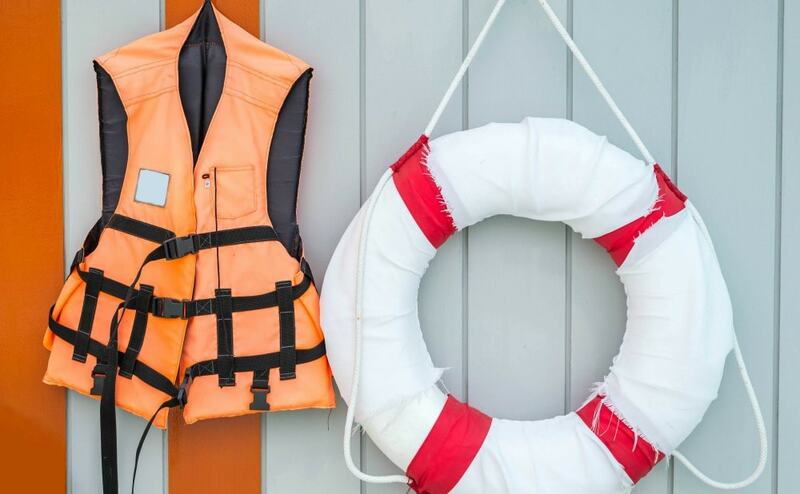 If you own a boat, keeping life preservers, such as life vests and flotation devices, are necessary to help you and your passengers avoid dangerous situations, such as drowning. 1. AEDs can help provide peace of mind. Knowing that you are prepared in case of an emergency on your boat will give you and your passengers peace of mind. With an AED aboard, you have a powerful tool that can help during life-threatening emergencies such as SCA. 2. You won’t have to rely on waiting for emergency services to arrive. If a cardiac emergency happens on your boat, even if you’re still at the docks, it could take an hour or more for medical emergency experts to get to you. And even if a rescue helicopter is dispatched to your boat’s location, over 20 minutes could pass by the time it finally arrives to your boat. Having an AED on board will allow you to act promptly, which is important because time is of the essence when it deals with sudden cardiac arrest. 3. AEDs can increase the chances of an SCA victim’s survival. By having quick access to an AED, you can significantly increase your chance or the chance of a loved one’s survival. In the event of cardiac arrest, a victim’s chances of survival are increased by roughly 90% after administering a shock from a defibrillator. Without access to a AED? The chances of survival plummet to 5%! Did you know that roughly 295,000 people suffer Sudden Cardiac Arrest (SCA) each year in the United States alone? And the survival rate for victims of SCA is only about 8.5%! That means that SCA claims more lives, every year, than AIDS, Alzheimer’s, breast cancer, colon cancer, prostate cancer, fires, car accidents and suicides combined. In fact, the number of people who die each year from SCA is seven times more than the number of those who die from breast cancer. Not only that, but according to the National Heart, Lung, and Blood Institute, ninety-five percent of people who have SCA die from it within minutes. According to the American Heart Association, the only effective method for treating SCA is to provide an electrical shock administered by an AED within three minutes of a victim’s collapse. All of this shows the importance of the rapid treatment of SCA with an AED. Whether you’re on land or out on the water, it’s important to keep in mind that sudden cardiac arrest can strike anytime or anywhere, and it’s a good idea to always be prepared. What should you do to stay prepared in the event of an emergency? You should definitely consider investing in and installing a marine defibrillator on your boat. It’s true that owning and operating a boat already comes with some hefty costs. But the cost of an AED is relatively affordable, especially when you consider the benefits of being able to enjoy the open water without worrying about your health or the health of your passengers. So whether you’re a Maryland or Florida resident, or anywhere in between, and are interested in finding out more about boat AEDs, contact Chesapeake AED Services today for more information! 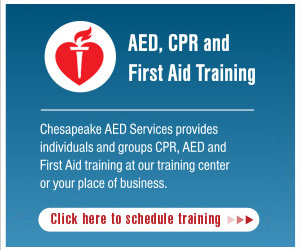 Chesapeake AED Services offers first aid and AED training courses that will ensure you are prepared to help someone in need, especially if they are suffering from sudden cardiac arrest. Our knowledgeable staff is here to help answer any questions you might have, and help you find the perfect AED boat package for your boat or yacht. Do You Need an In-Home AED? Need Replacement Batteries or Electrodes?